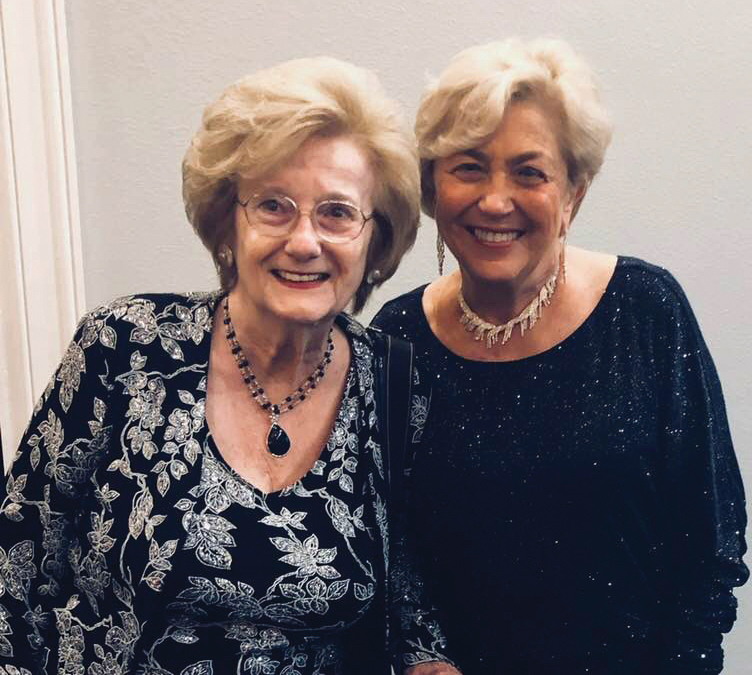 Eileen Hult, right, and Mary Alys Cherry are happy to see the big crowd celebrating Bay Oaks Country Club’s 30th anniversary. 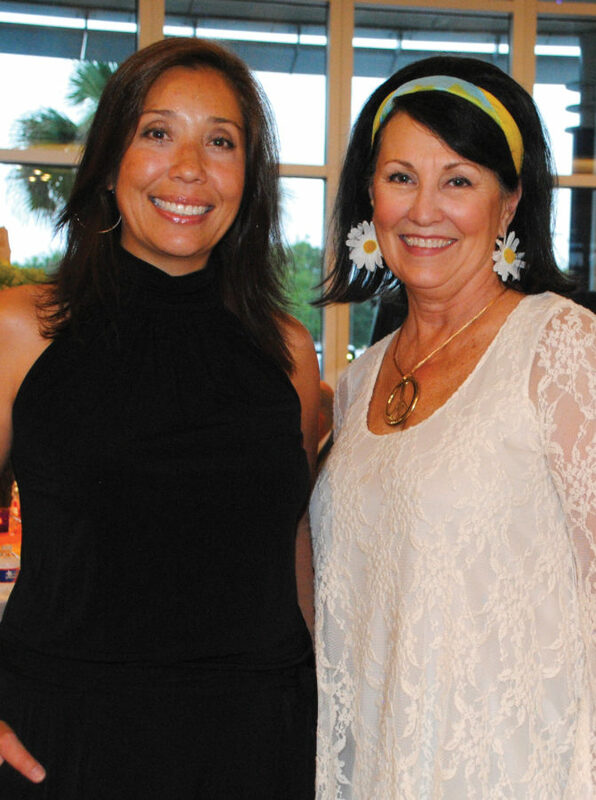 BAY OAKS Country Club in Clear Lake is turning 30 years old this year, so club executives hosted a black tie gala for members to mark the occasion and joined them in celebrating the milestone. It was quite a party! General Manager Stephen Morris joined Head Golf Pro Scott Olsen, Member Relations Director Cassandra Brown, Private Events Director Ashley Williams and Golf Course Superintendent Kyle Brown in welcoming the crowd, which included Board of Governors Chairman Julia Gallagher and her husband, Abe, and Bay Oaks Women’s Association President Susan McCoy and her husband, Mike. John and Jeannette Koerschner, Mike and Sharon Phelps and George and Glenna Crist were among several there who have been members for 30 years, so you can imagine what fun they had thinking back over all the great events at the club through the years. Early arrivals included Board of Governors members John Whalen, with his wife, Patty; Jim Maultsby, with his wife, Cheryl; Yvonne Perrin, Perry Laabs and his wife, Sue; and Jodi Schnabel and her husband, Kirby; plus Murry and Sandy Lantz, John and Roemehl Dewey, Glenn and Carlene Langford and Craig and Cindy Zook. Still others joining in the celebration were Russ and Mary Colombo, Dane and Darla McKitrick, Luis and Teresa Albuerne, Ron and Bo Lohec, Joseph and Carol Base, Sue and Everett Lyons, Marty and Amy Schweers, Mitzi and Dr. Mike Romanko, Malcolm and Sue Franklin, Danele and Jack Buehler, Joseph and Sue Kazda, Ray and Shiva Landry, Annette Dwyer and Pat Monks and Gene and Eileen Hult, to name a few. Quite a celebration for a place we’ve all enjoyed so much through the years. 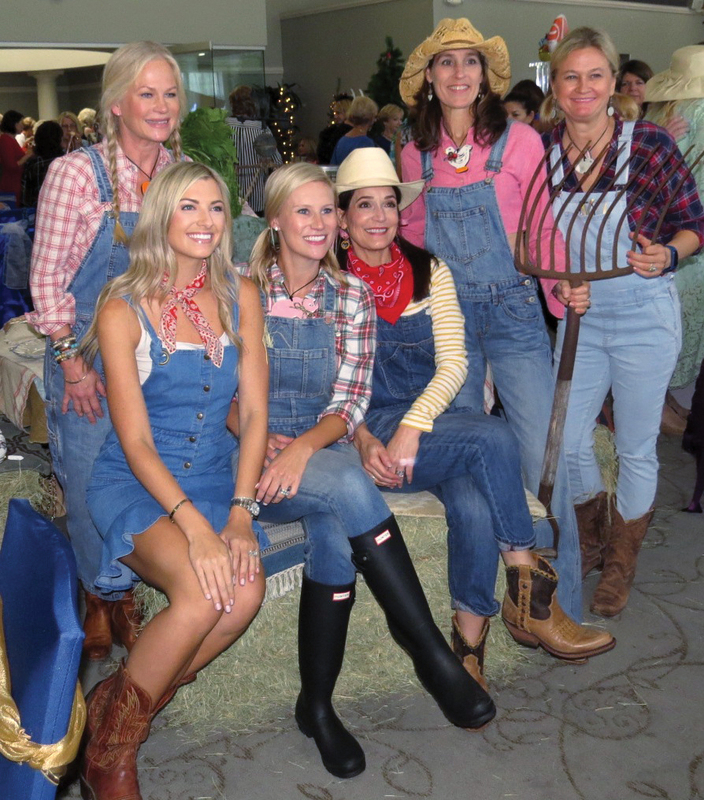 These pretty cowgirls sit for a photo at the Bay Area Museum Guild’s Just A Pretty Table Luncheon. 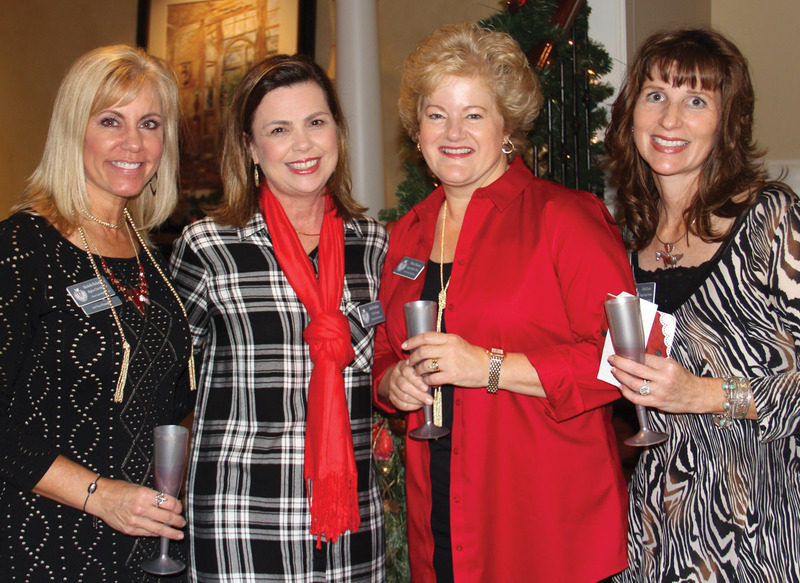 They are, from left, Courtney Myers (standing left), Ashton Garrison, Virginia McMullen, Mary McMullen, Tracey Webb and Stacy Bush Lyon. FEW EVENTS remain as popular year after year as the Bay Area Museum Guild’s Just A Pretty Table. Credit Angie Weinman for that. Year after year for over a decade she had lined up some of our community’s most talented ladies. Each picks a theme for their table, gets a crew of helpers, each contributing ideas and – voila! ­­– everyone is amazed. Plus, proceeds help support the charming little Bay Area Museum over in Clear Lake Park. Some of the tables are just jaw-dropping beautiful – the kind you’d love in your home – while some are humorous but always memorable. Usually, those sitting at the table carry out the theme in their dress. If you haven’t attended, make next year a must-see. 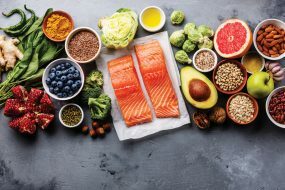 Angie and her team of volunteers — Sandi Allbritton, Jan Larson, Ava Galt, Jannine Galt and Anita Fogtman – have already started working on the 2019 event. See you there. There was no shortage of folks on hand to greet Houston Mayor Sylvester Turner when he arrived at Bay Oaks Country Club in Clear Lake for the Clear Lake Chamber Government Affairs Committee meeting. With him are, from left, League City Mayor Pat Hallisey, Chamber President Cindy DeWease, Kemah Mayor Carl Joiner, Miss Texas USA Nancy Gonzalez and State Rep. Dennis Paul. 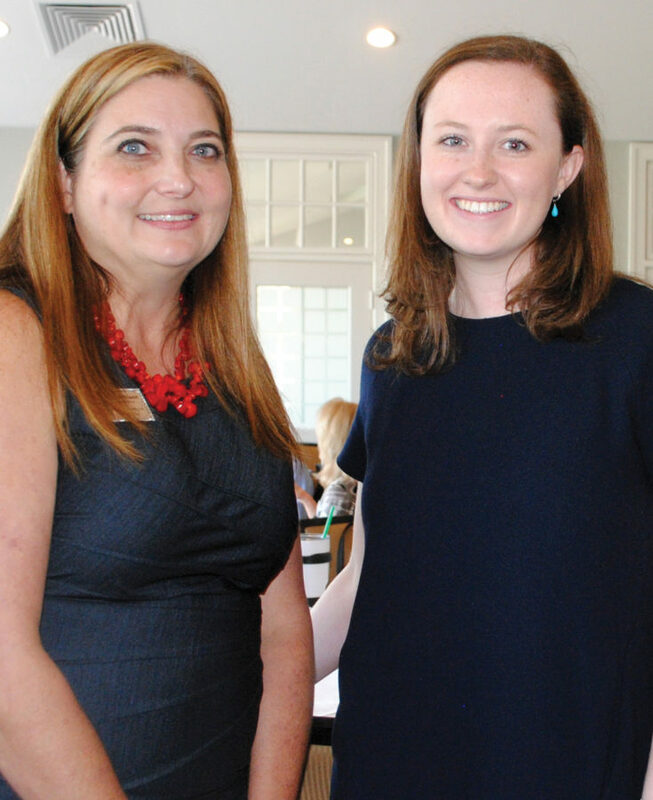 Jordan McGinty, right, of Councilman Dave Martin’s office, stops to chat with Dawn McDonald of State Rep. Dennis Paul’s office at the Clear Lake Area Chamber Government Affairs Committee meeting. 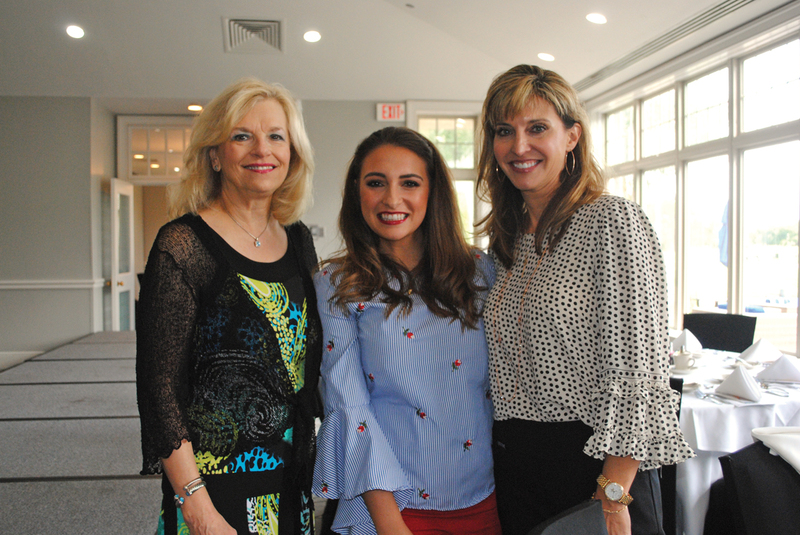 THE CLEAR LAKE Area Chamber’s Government Affairs Division drew quite a crowd when members held their quarterly meeting at Bay Oaks Country Club. Little wonder they did. 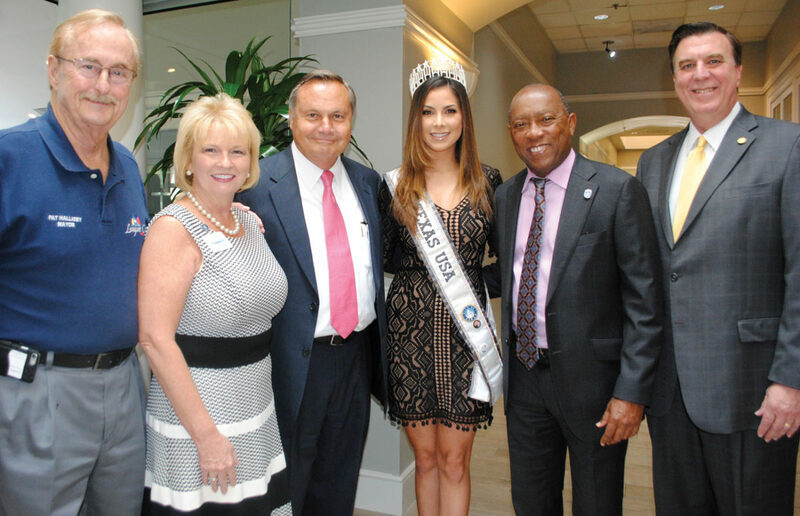 They had Houston Mayor Sylvester Turner as their speaker and invited Miss Texas USA Nancy Gonzalez to introduce the mayor. Early arrivals included State Rep. Dennis Paul, League City Mayor Pat Hallisey, Kemah Mayor Carl Joiner, who is also the chamber chairman, Houston City Councilman Dave Martin, Chamber President Cindy DeWease and Vice Chairman Brian Freedman. The mayor discussed a variety of subjects, initially letting the crowd know how lucky this area is to be represented by Councilman Martin and Representative Paul and how he has enjoyed working with them in the past and how he looks forward to working with them in the future. After praising San Jacinto College for its workforce readiness programs and all it has been doing to put students in jobs and help industry fill jobs, he noted that there are six million jobs in the U.S. that cannot be filled because applicants do not have the proper training. That led into a hot topic for Clear Lake City, where a woman wants to put a homeless shelter on El Camino Real in the heart of its downtown area and only two blocks from homes. The mayor, who first heard about it from TV, wanted his audience to know that the city had nothing to do with it, that no permits had been obtained and it is not a simple process. “It is not a city deal,” he said, adding the he did not think shelters were the answer. “The best way to respond to homelessness is to put people in housing, not shelters. Please, please know that is not something that is on the drawing board, and there is no funding for it,” he cautioned. Turning to the national infrastructure program proposed by President Trump, the mayor thought the Coastal Spine project should be included. Meanwhile he said, he had learned that Washington is toying with ideas on how to pay for all the proposed projects. 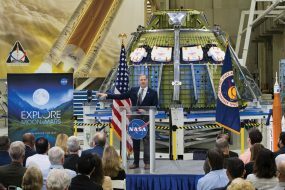 Among a number of thoughts he shared with the crowd, he said he thinks we need a theme park that is uniquely us — a fun and amusing park but unique to our region. 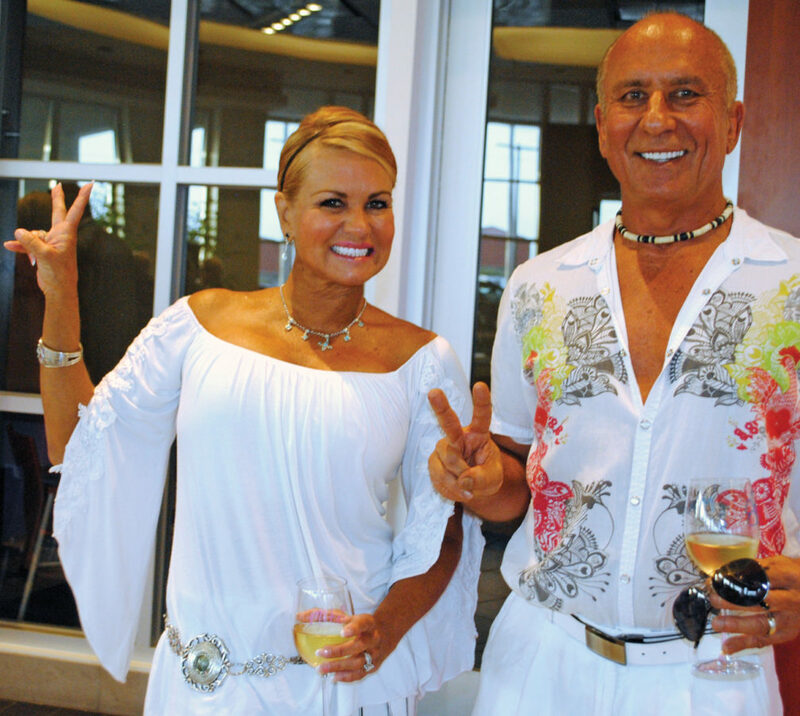 Dr. Mike Romanko and his wife, Mitzi, give the peace sign so popular in the 60s at the Lunar Rendezvous Splashdown Party. BACK IN THE SIXTIES, a coveted invitation got one into a Splashdown Party when friends and neighbors welcomed astronauts back from journeys into space. Fifty years later, the tradition goes on. Except this time it was, well, a little different. 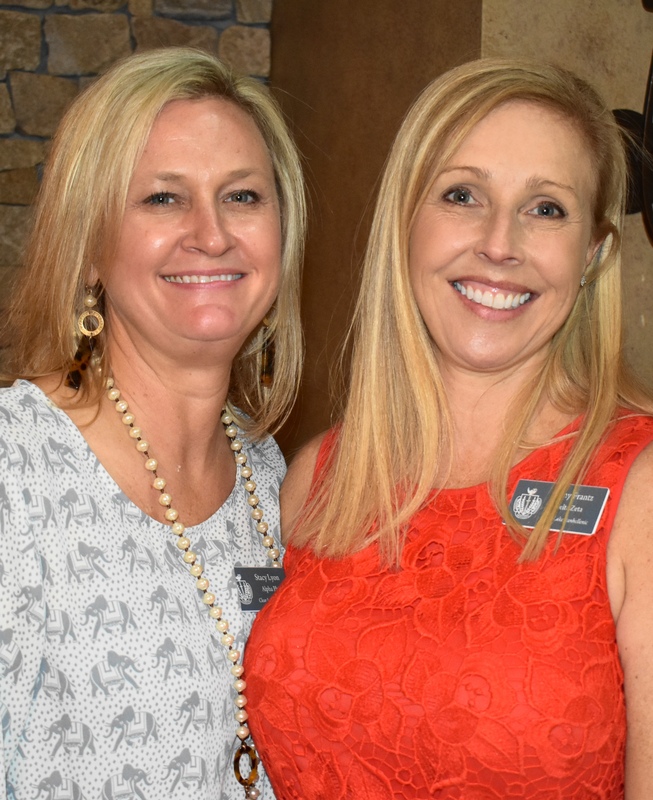 Co-Chairmen Kristy Tankersley, Renee Ditta and Linda DeMasie wanted this Lunar Rendezvous Splashdown Party to be a night of fun – a night to remember. And, that it was. 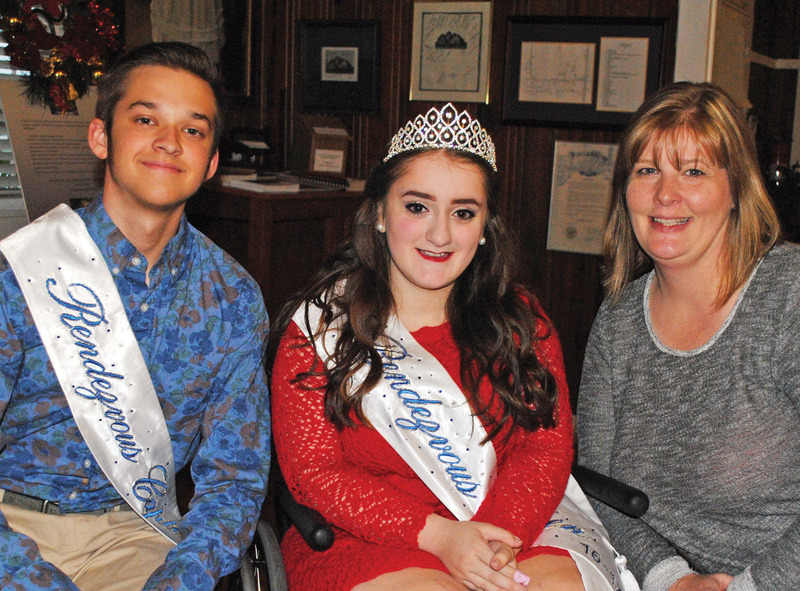 It also kicked off the Festival’s string of July activities, which include a 5K fun run and walk, fashion show, religious service and the Coronation Ball. Festival Chairman Dinah Matthews, right, and Vice Chairman Tisa Foster prepare to greet guests. Most dressed in 60s attire and flashed peace signs as they danced to the music of Phil Pampolina with the co-chairmen and their husbands – Jon Tankersley, Judge Louie Ditta and Michael DeMasie — leading the way as Mercedes-Benz dealer Jerry Foyt and his wife, Kate, hosted the event at the dealership in League City. Both Festival Chairman Dinah Matthews and Vice Chairman Tisa Foster were there to welcome Michael and Ann Wismer Landolt, Tom and Gloria Wong, Ann and Dr. Jim O’Malley, Ron and Pat Biddle Karl, Angie and Matthew Weinman, Gene Hollier, Phil and Ginger Pampolina, Alice and Lou Marinos, Mary Ann Shallberg and Mitzi and Dr. Mike Romanko, to name a few. Special guests were Ch. 13 ABC News Anchor Tom Koch and his wife, Brenda. Great way to kick off the string of festival events. Clear Lake Chatter: What fun it is to party every day! NO DOUBT about it – the Bay Area loves to party, and what better time than the holidays? Actually, the wee set got the parties started with the Bay Area Houston Ballet’s Breakfast With the Sugar Plum Fairy at South Shore Harbour Resort and the Bay Area Museum Guild’s Toyland Fantasy breakfast at Bay Oaks Country Club. What fun it was to watch the little ones in their party garb, dancing around and wearing smiles a mile wide. Bay Area Museum Guild President Brandie Corrao welcomes Lunar Rendezvous Queen Madelyn Chicester and Festival Capt. Alex Struss to the Guild Holiday Open House at the museum. And then the parties began with Museum Guild members opening the museum doors Sunday, Dec. 4 for their annual Holiday Open House, where President Brandie Corrao joined Co-Chairmen Ava Galt and Jan Larson in welcoming the crowd that included Taylor Lake Village City Councilman Tony Galt, Matthew and Angie Weinman, Delicia and Alex Struss, Cindy and Dave Kuenneke, Anita Fogtman and Emmeline Dodd. Lunar Rendezvous Queen Madelyn Chicester joined the party, as did Festival Capt. Alex Struss with the Clear Lake Sound Waves providing entertainment. 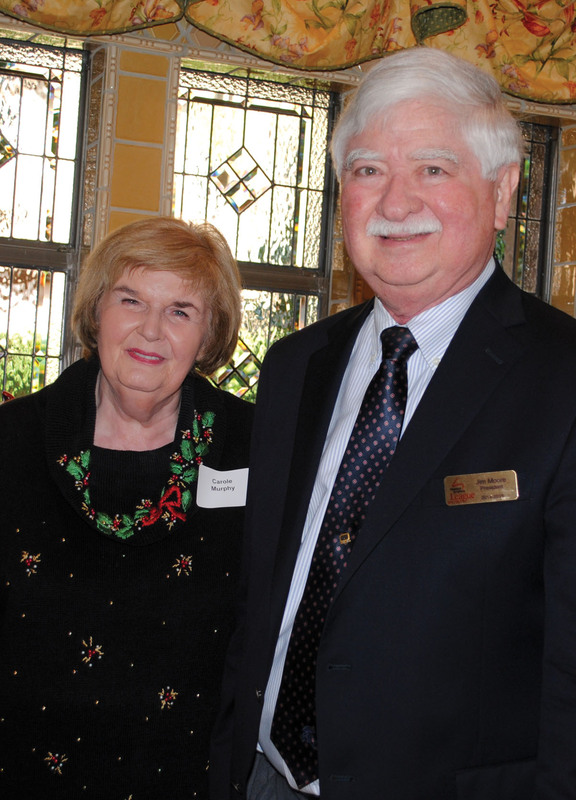 UH-CLEAR LAKE kept up the beat, hosting its big annual Holiday Reception Dec. 7 at Bay Oaks Country Club, where retiring President Bill Staples and his wife, Darlene, were on hand to welcome the happy crowd. Area Legislators Dennis Paul of Clear Lake and Ed Thompson of Pearland were among the crowd, as were Pearland Mayor Tom Reid, attorneys John Gay and his wife, Becky Reitz; Marilyn and Glynn Lunney, Alan and Peggy Hill, Theresa Presswood, Marilyn and Charles Sims, Ken and Nedra Gurry, Kippy Caraway, Mary Ann Shallberg, Rob and Karen Barbier and Rhonda Thompson. Plus, Science and Engineering Dean Zbigniew T. Czajkiewicz, College of Education Dean Mark D. Shermis, Business Dean William T. Cummings and Human Sciences and Humanities Dean Rick J. Short. 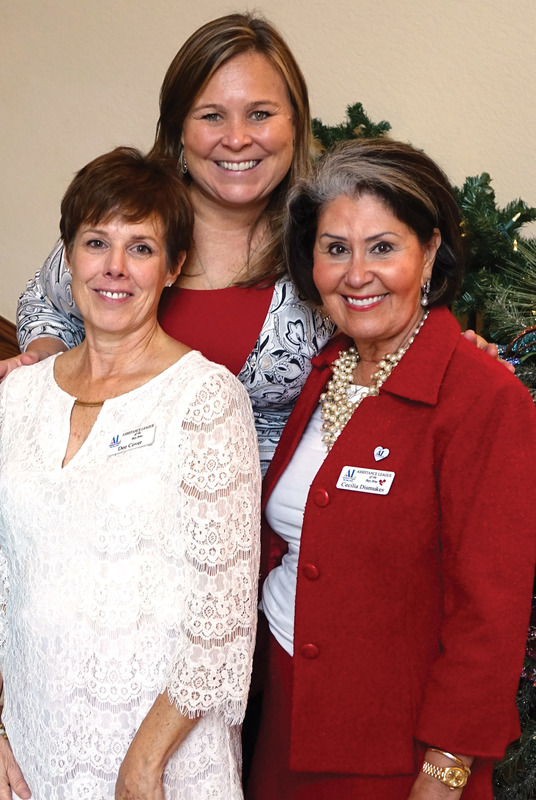 Michelle Richardson, Kelli Baliker, Diana Shuman and Ondi Lyon, from left, share a light moment as at the Clear Lake Area Panhellenic Holiday Brunch at the Shuman home in Bay Oaks. 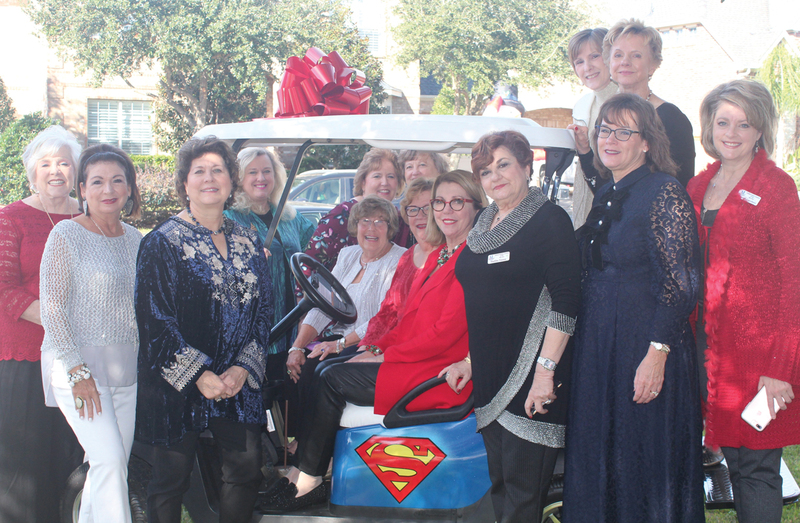 CLEAR LAKE Panhellenic kept up the beat the next day, Dec. 8, with Diane Shuman hosting the sorority alumnae group’s big annual Holiday Brunch at her home in Bay Oaks. 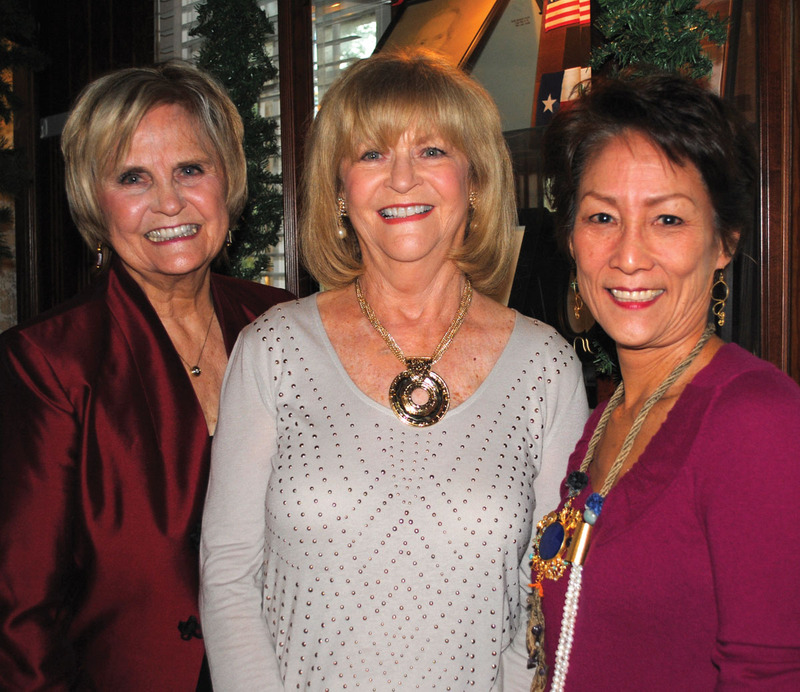 Diane, in a bright red outfit, joined Brunch Co-Chairmen Judie Ferguson and Sue Ellen Jennings, both wearing colorful Santa hats, and Panhellenic President Jill Reason, wearing white, in welcoming the festive crowd. 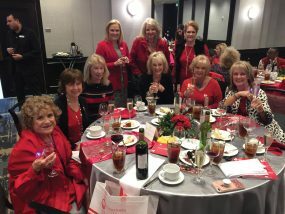 Among them were Peggy Clause, Lisa O’Brien, Jennie Hampton, Jo Cat Bruce, Michelle Richardson, Sue Broughton, Judie Ferguson, Kay Lee Benoit, Ondi Lyon, Ruth Beecher, Ellen King, Karen McCorkle, Diane Overman, Jo Nell Hunter, Kathie Wiley, Barbara Dickey, Judie Raiford and Kelli Baliker. 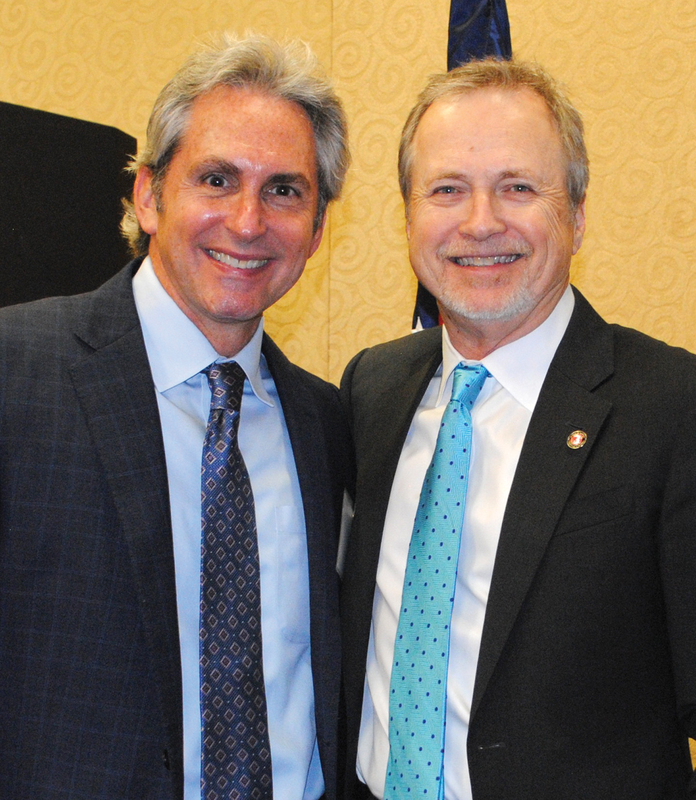 BAY AREA HOUSTON Economic Partnership members gathered at Lakewood Yacht Club later that day with Mayors Glenn Royal of Seabrook, Johnny Isbell of Pasadena, Carl Joiner of Kemah and Michel Bechtel of Morgan’s Point in the crowd that filled up the ballroom. Joining them were State Rep. Dr. Greg Bonnen, Houston City Councilman Dave Martin and a host of business men and women celebrating the holiday season. Plus, UHCL President Bill Staples, San Jacinto College Chancellor Brenda Hellyer and Clear Creek ISD Superintendent Greg Smith. JOHNSON SPACE CENTER Director Ellen Ochoa hosted another big party with a number of city officials and aerospace executives joining her and her husband, attorney Coe Miles, Friday, Dec. 9 in JSC’s Building 9 for some good conversation and an update that included noting that we have had a continuous presence on the International Space Station now for 16 years. Familiar faces in the crowd included Mayors Jon Keeney of Taylor Lake Village and Louis Rigby of La Porte with their wives, Lynn and Marlene, Jacobs Technology Senior VP and GM Lon Miller, Barrios Technology President Robbie McAfoos and his wife, Victoria, and Clear Lake Area Chamber President Cindy Harreld DeWease and her husband, businessman Jeff DeWease. Plus JSC Deputy Director Mark Geyer, who brightened up the party when he arrived in one of the most colorful jackets we’ve ever seen. 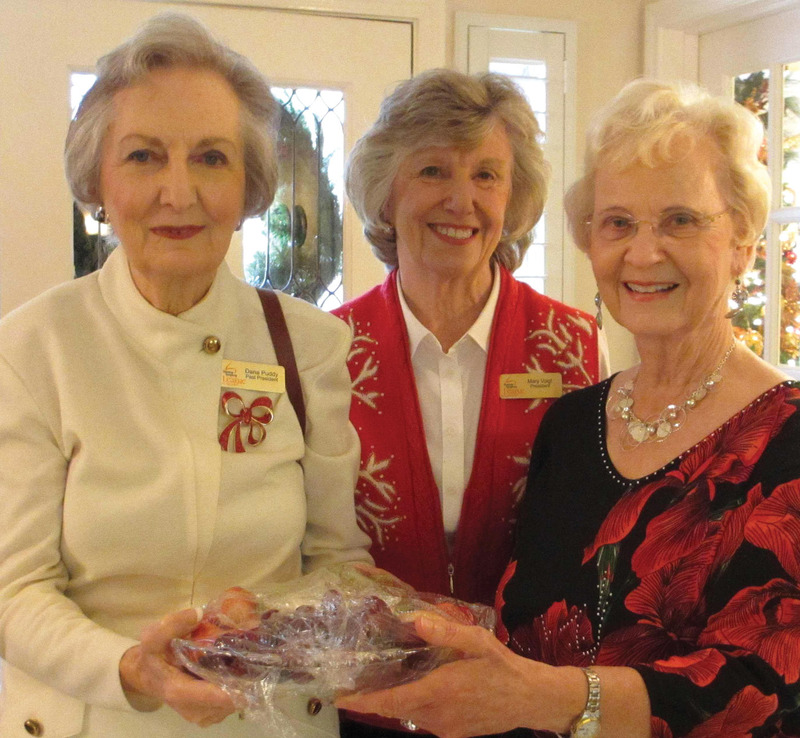 Assistance League Holiday Reception hostess Cecilia Dismukes, right, joins President Dee Cover, left, and Reception Chairman Elizabeth McCarty before the annual party at the Dismukes’ lovely home. 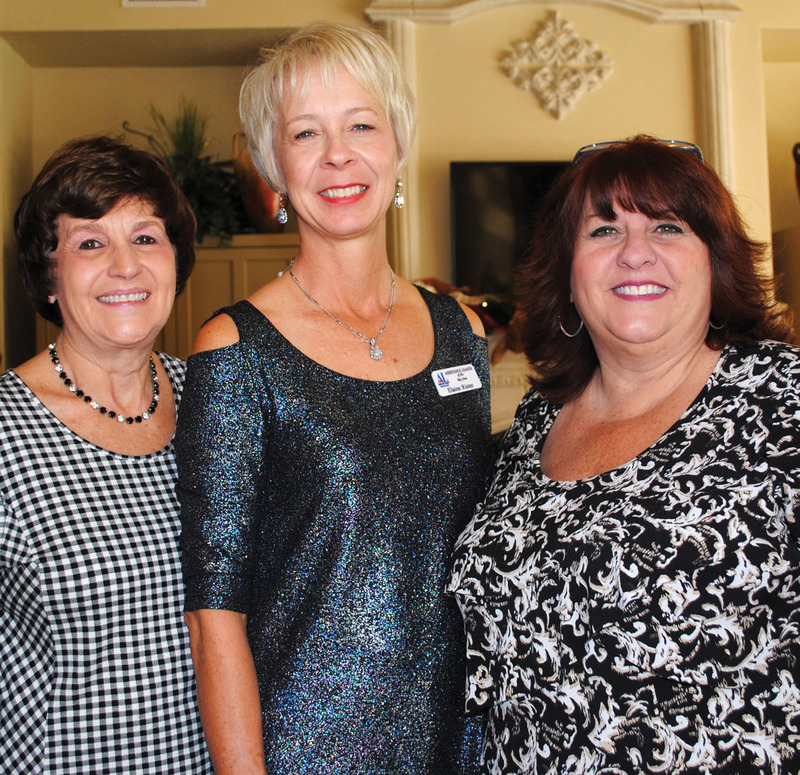 ASSISTANCE LEAGUE members were all wearing big smiles as Cecelia Dismukes hosted their big annual Holiday Reception at her home in Kemah’s Waterford Harbor. 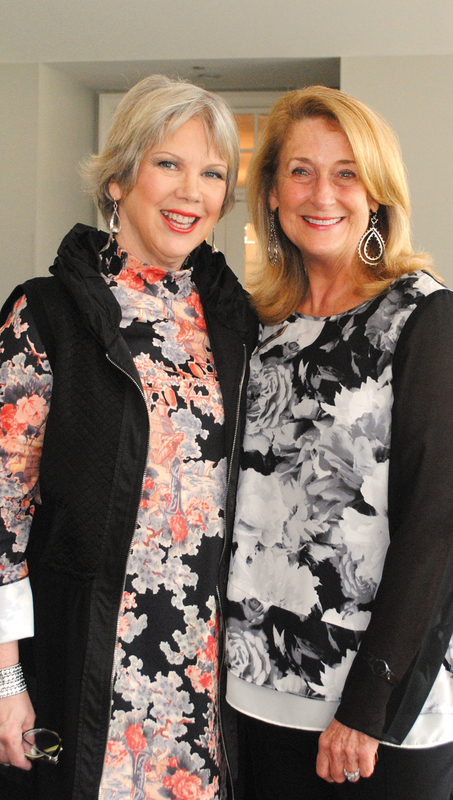 ALBA President Dee Cover and Chairman Elizabeth McCarty joined the hostess in welcoming the arriving crowd, which included Yvonne Perrin, Pam Bungo, Melanie Lovuola, Kathy Panneton, Justine Powell, Badiha Nassar, Kim Barker and Lisa Holbrook. Others you might have spotted were Brunella Altemus, Becky Richey, Barbara Groh, Katy Bastedo, Kathleen Courville, Mari Stockard-Young, Leslie Schwanke, Dee Wolfe, Janet Vallelungo, Elaine Rister, Barbara Weitenhagen, Jean Simms, Mary Vaughn, Brook Cimas, Betty Walcott, Sandra Kelver, Cookie Derderian, Amy Wortham, Betty Stoub and Joyce Alderman. 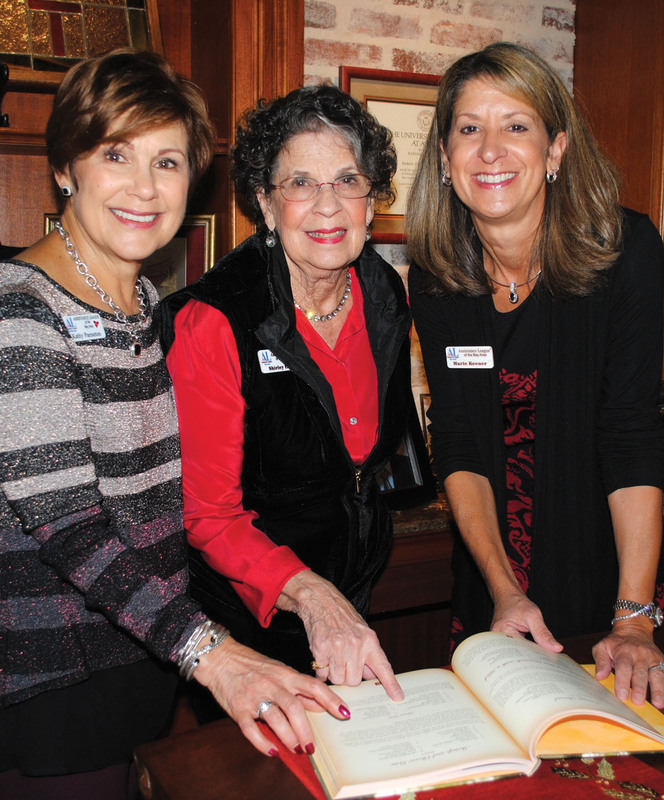 Houston Symphony League Bay Area President Mary Voigt, center, looks on as Dana Puddy, left, and Alice Steele prepare for the holiday party. 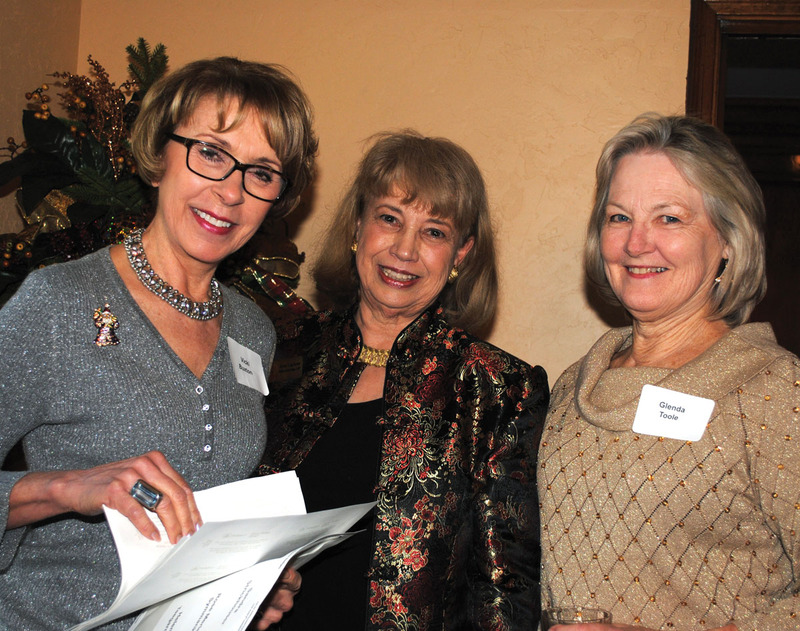 HOUSTON SYMPHONY League Bay Area members gathered at the home of Vicki Buxton in Clear Lake for their annual Holiday Reception, chaired by Special Events Coordinator Carole Murphy. 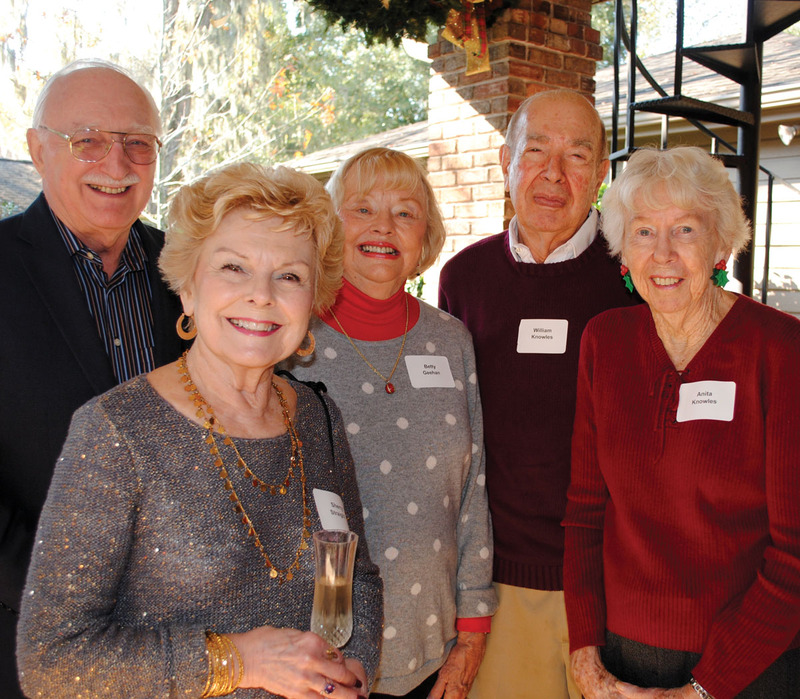 Buzzing around the Buxton home, you probably would have bumped into President Mary Voigt, Dana Puddy, Pat Biddle Kahl and Alice Steele and former Presidents Jim Moore and Patience Myers – just a few of the many who dropped by for the holiday celebration.